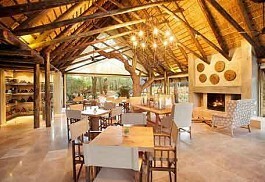 Kapama Private Game Reserve is located close to Hoedspruit Airport. 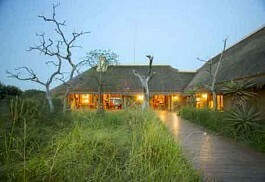 The reserves offers luxurious accommodation in a small Big 5 Game Reserve. Visit the Hoedspruit Endangered Species Centre, which focuses on the conservation endangered animals. Kapama Game Reserve is situated in the Limpopo Province in South Africa, an area famous for its fantastic safari vacations. This small reserve consists of 13000 hectares of pristine African bushveld, yet it offers all the game found in bigger reserves, including 42 mammal species and approximately 350 species of bird. The reserve borders the Thornybush Private Game Reserve and forms part of the Greater Kruger Park, which is a group of private nature reserves located on the western boundary of the National Park. It offers remarkable natural diversity and includes the notorious Big 5: lion, leopard, elephant, buffalo and rhino. Game drives are conducted in safari vehicles accompanied by expert guides. Kapama Game Reserve offers four luxurious camps and lodges inside the reserve; namely, Kapama Lodge, Kapama River Lodge, Kapama Buffalo Camp and Kapama Karula. These camps and lodges can accommodate a total of 208 people between them. Kapama is the largest single-owned game reserve in the region, although it's total size makes it one of the smaller ones. It borders the Thornybush Game Reserve and is part of the Greater Kruger Park. Game viewing is not compromised due to its small size and it hosts about 42 different mammal species and approximately 350 bird species as well as a myriad of smaller species. Hoedspruit airport is perfectly situated to receive guests flying in from Johannesburg or Cape Town. From the local airport, it is only a short road transfer to the various lodges. Kapama Game Reserve has accommodation suited to families, honeymooners, or friends travelling together. There is ultra-luxurious accommodation as well as more comfortable, affordable options, while all game activities pack the same excitement. Kapama Buffalo Camp offers visitors a luxurious yet traditional safari experience in East African-styled, raised tents offering great views. 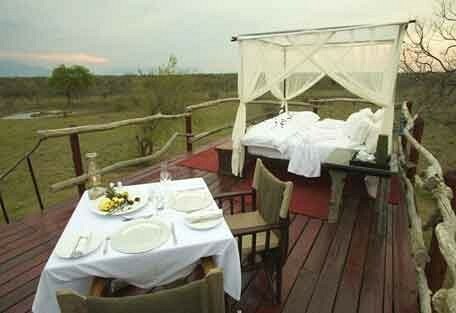 Guests can enjoy an intimate and personal safari with the camp catering for only 16 guests at a time. Kapama Karula is situated on the banks of the Klaserie River offering guests a tranquil setting. Kapama Karula means “the place of peace” and is true to its name offering guests an intimate safari experience. Kapama River Lodge is situated in a bend on the Kapama River within the Kapama Game Reserve with the magnificent Drakensberg Mountain range in the background. 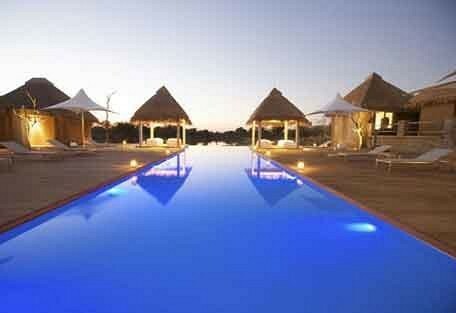 Kapama River Lodge provides luxurious accommodation with modern amenities and outstanding service. Kapama Southern Camp is a newly built luxurious traditional safari lodge with air-conditioned thatched suites, private verandas and uninterrupted views of the African bush. 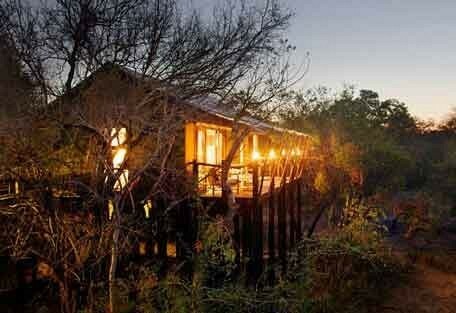 It is situated on the southern most section of the Kapama Private Game Reserve. Kapama Game Reserve is situated in the Limpopo Province, an area renowned for offering superb safari experiences. It borders the Thornybush Gamae Reserve and forms part of the Greater Kruger Park. Kapama consists of 13000 hectares of prime African bushveld offering a big game safari experience, as well as unique elephant back safaris, for which Camp Jabulani is known. 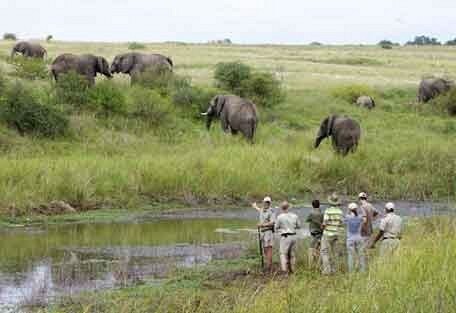 The reserve offers magnificent natural diversity and includes the 'Big 5': lion, leopard, elephant, buffalo and rhino. 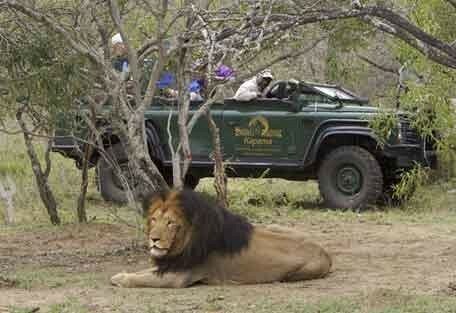 Game drives are offered in open 4x4 vehicles conducted by expert guides. Guests can climb aboard and set about exploring the rolling savannah grasslands and riverine forests that make up this spectacular African reserve. The various lodges and camps in the reserve offer at-home activities, so that even in between game drives there is something to keep guests busy. Swimming pools provide respite from the heat during summer (and sometimes even winter), while some lodges can arrange for white water rafting, micro-lighting and village tours. There really is something for everyone. Kapama Private Game Reserve offers mild weather conditions year round and is situated at an approximate altitude of 500m above sea level. Summer weather is experienced from October to March when day time temperatures can reach highs of 42°C and lows of 20°C. The summer rains bring lush green bushland, however the vegetation is dense and finding animals becomes more difficult. The colder winter months of May, June and July experience daytime highs around 26°C and night time lows of 8°C. Winter is also the dry season when water is scarce and animals tend to congregate around the water sources, making game viewing in the dry winter months the best. The early mornings and evening game drives get very cold. The northern Drakensberg Mountain range provides a majestic backdrop to Kapama River Lodge, the largest lodge in the Greater Kruger National Park region. It lies on a bend of the Kapama River, which is usually dry, but from time to time can flood with the water, which reaches all the way to the steps of the lodge swimming pool. Kapama Southern Camp offers luxury safari accommodation, warm hospitality and friendly service in a tranquil setting, which will satisfy even the most discerning nature lover's taste, while it accommodates for families in 4 family suites. Camp Jabulani is a premier camp in Kapama Reserve, offering unrivalled luxury and a safari with a difference. 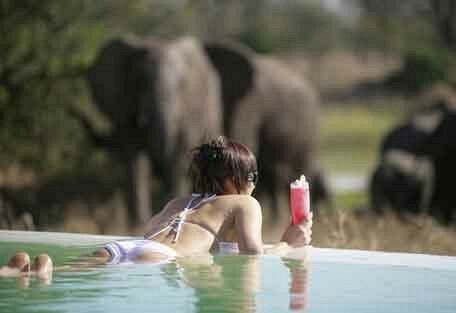 The name comes from the elephant, Jabulani, who leads the elephant back safaris conducted at this camp. There is also a decadent spa at this camp, which offers a variety of therapeutic treatments. Kapama Karula is situated on the banks of the Klaserie River offering guests a tranquil setting. Kapama Karula means "the place of peace" and is true to its name offering guests an intimate and peaceful safari experience. Sun Safaris can arrange scheduled flights from OR Tambo International Airport (Johannesburg International) to Hoedspruit Airport (also called Eastgate), depending on guests' timing and itineraries. A transfer from OR Tambo to Kapama would take roughly 6 hours, whereas flying directly to Hoedspruit leaves only a short road transfer to the lodge. Once guests arrive at the airport of choice, they will either have arranged with their Sun Safaris agent a car hire option (self-drive) or road transfer to the lodge where they will be staying. All Kapama lodges are accessible via self drive with a sedan rental car from anywhere in South Africa. To self drive from Johannesburg will take approximately 6 hours.